We were able to use your valuation of my client’s practice to come to a quick and fair settlement in the case. Circumference is a business valuation firm specializing in determining fair market value of professional practices and lower middle market businesses with annual sales between $50,000 and $15 million dollars. Valuations Benefit Buyers and Sellers. Professional business managers agree that whether buying or selling, the first step in a transaction this important is to get professional help. A Circumference valuation provides both the buyer and seller with unbiased information about the current worth of the business. A realistic market value and a written practice appraisal paints a picture of where the practice has been and where it is going. Areas that can be improved to grow the business and increase revenues. A basis to support the asking price. Knowing Market Value Is Beneficial in Other Scenarios Too. A valuation is also essential for a partnership change, partnership leading to a buy-in, incorporation, re-financing, tax negotiations, financial and estate planning, probate or in a divorce settlement. A Circumference valuation provides the financial information you need to make informed decisions. 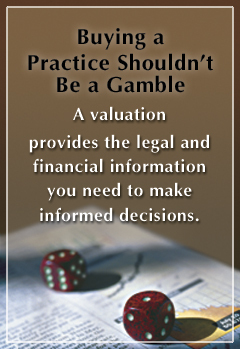 We Have Answers to Valuation Questions.